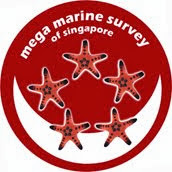 Today marks the start of another series of crazy wake up time to check out our shores in Singapore. A small team visited Punggol Beach on a very early morning. The Punggol beach I knew was a rocky beach with whiffs of funny smell coming from somewhere. Never have I expected this stretch of beach to come alive during a low spring tide. The team covered both sides of the shore from the jetty. 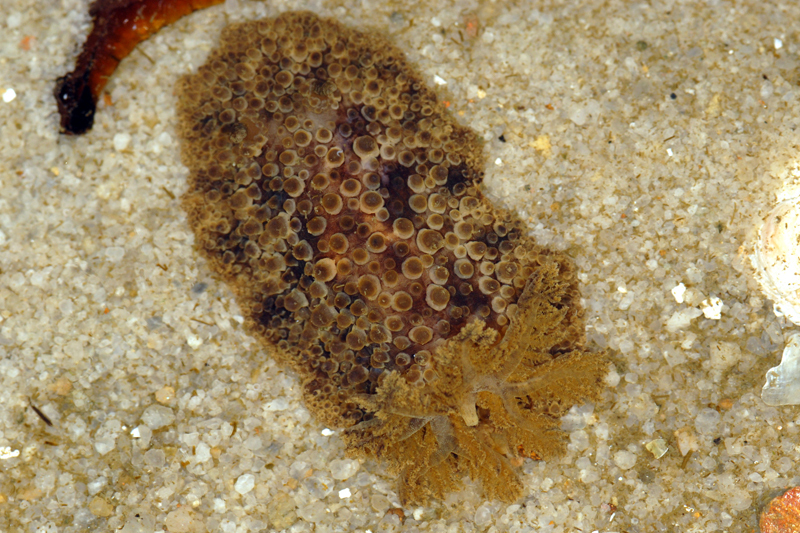 When I reached the shore, Ria was so excited to show this beaded nudibranch (Hoplodoris nodulosa). At that moment, all my gears where still in my bag. A quick setup and I was on my way to documenting my shore findings, including the above nudibranch. The rocks are really alive with many critters. Though I may not be able to see them but I can hear all sorts of sounds coming from them. 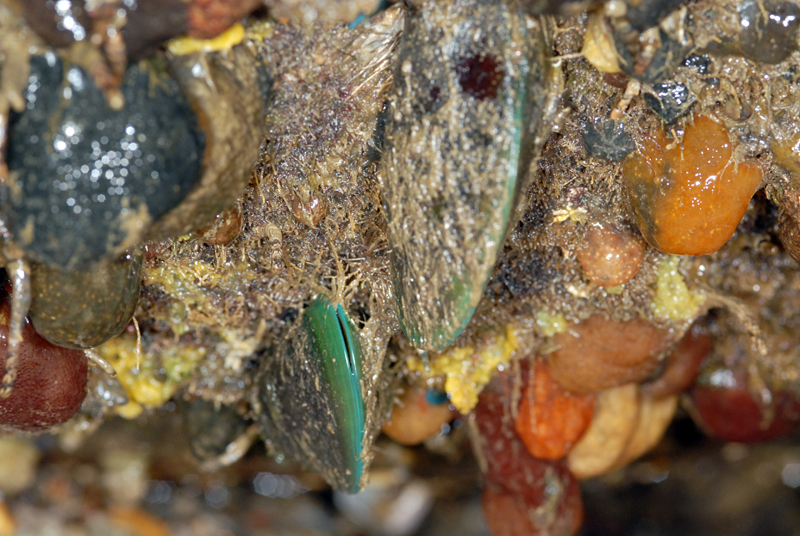 Those who have been to Punggol beach would know that the rocks there are covered with green mussels (Perna viridis) and nest mussels (Musculista senhousia). There were also many drill snails found on rocks and many of the rocks had snail eggs on them. The eggs comes in various shapes, sizes, colours and arrangements. 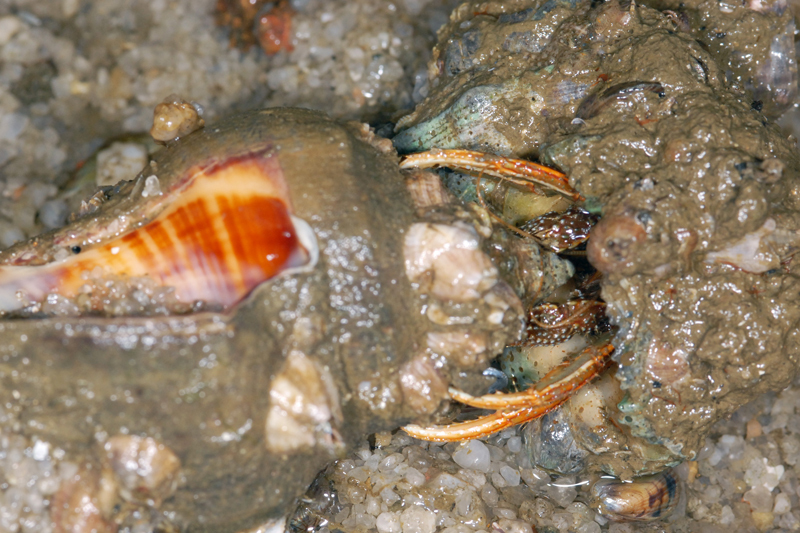 Plentiful on the shore are stone crabs (Myomenippe hardwickii). 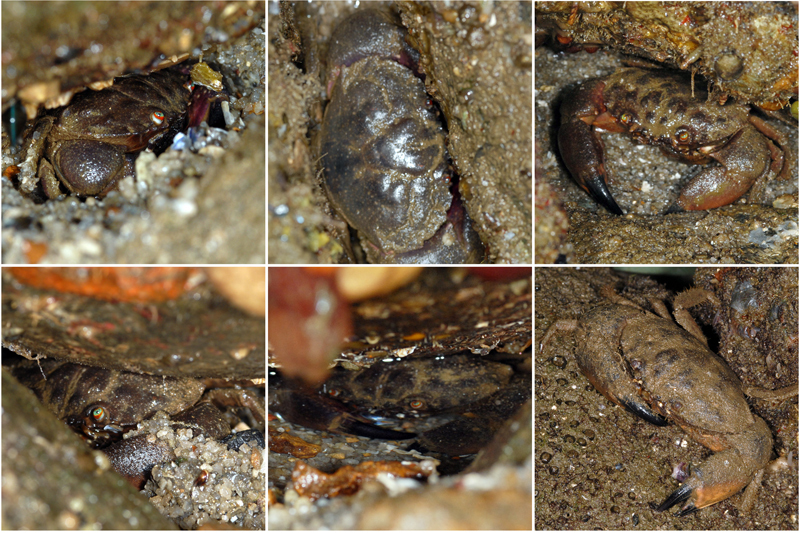 Many of the stone crabs I saw were hiding below the big rocks on the rocky side of the beach. 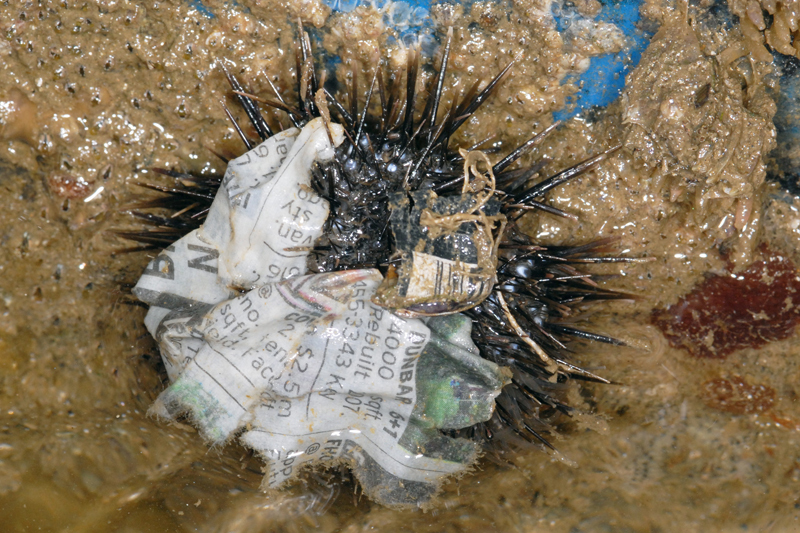 On the rocky side of the shore, I saw many black sea urchins (Temnopleurus toreumaticus). The ones I saw were all alive. This is my first time seeing sea urchins with my own eyes. 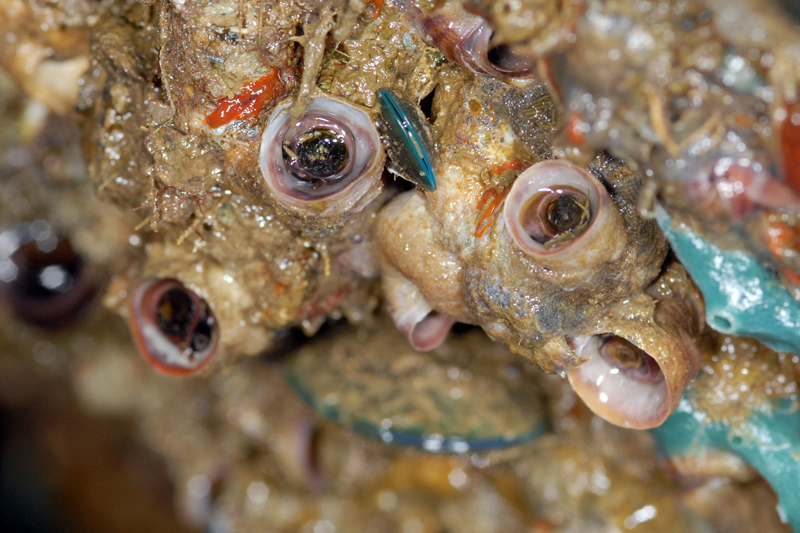 The sea urchins camouflage themselves with all sorts of items found on the shore. 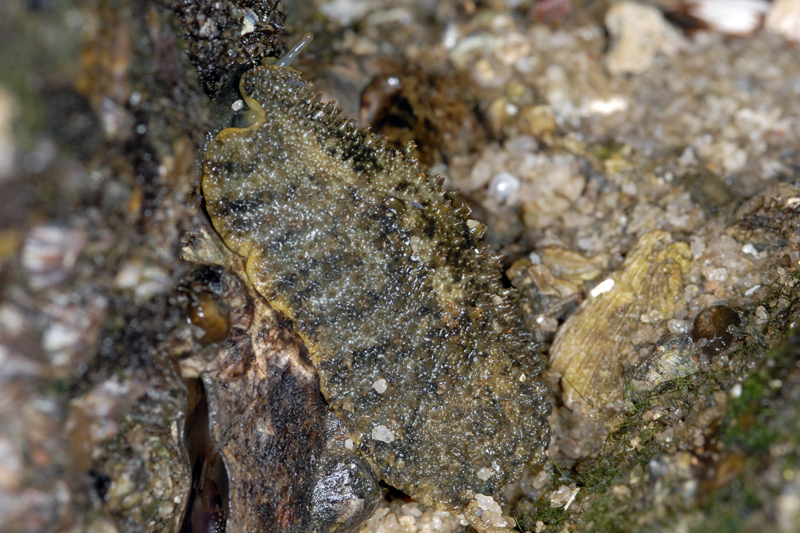 Found on the big rocks also were sponges of different colours and worm snails. I was wondering what those funny tubes with "doors" were until I read Ria's post. 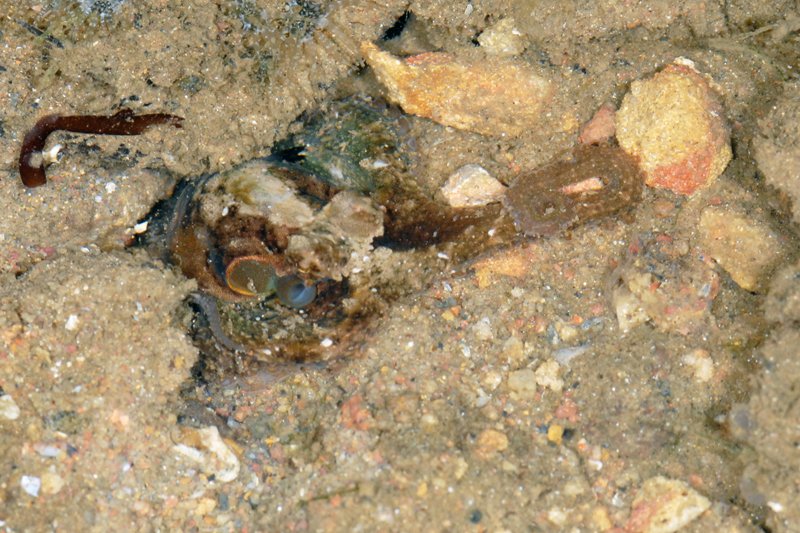 I also saw a stranded snapping shrimp at the big rocks area in a small stream. It was kind enough to pose on both sides for me. Then I rescued a badly injured brittle star further up the shore where It was drier. It had only had three arms to move and was struggling badly. I used a small container, scooped it up and placed it in a shallow pool nearby. It disappeared quickly when placed in the pool. Futher down towards the bigger piles of rocks, I found a pair of purple climbing crab fighting and three onch slugs before heading to the other side of the jetty. On the other side of the jetty there were plenty of brittle stars on this part of the shore. I saw a bristleworm. Kok Sheng later turn over one the rocks and he found many of them. While observing the many snapping shrimps moving in and out of their borrows, I noticed an octopus. It was making an attempt to catch the snapping shrimp but failed miserably, causing a few shrimps to jump out of the water. I only managed to capture the octopus when it when back to his hiding hole. The cutest animal seen today was the sponge crab. Mei Lin spotted one next to the one I saw. I was wonder what is that moving object until Mei Lin asked me to flip it over and told me it's a sponge crab. Flip it over and you get a sponge crab. So cute looking. 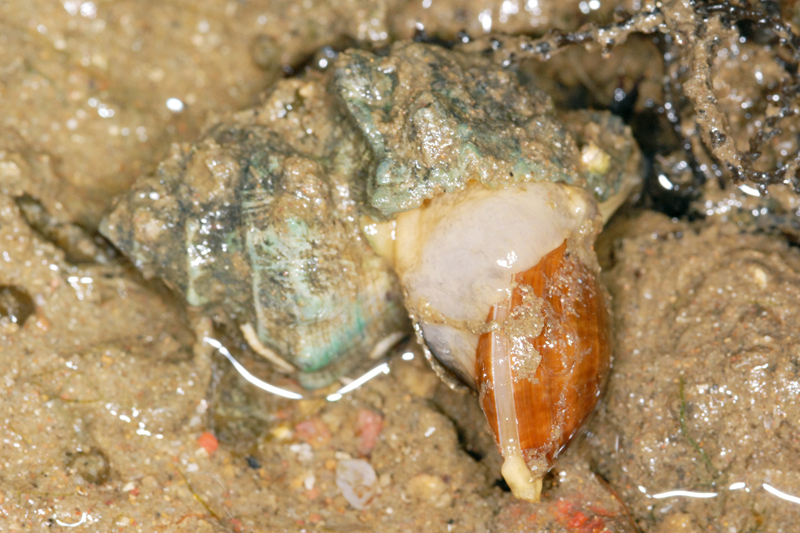 A snail was seen eating up a bivalve. It looked like it was swallowing the whole bivalve whole. 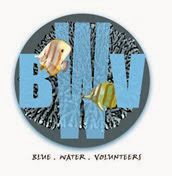 There were very small kite butterflyfish (Parachaetodon ocellatus) seeking shelter in the shallow pools. The team found another beaded nudibranch we saw at the start of our trip and then a rose nudibranch (Dendrodoris fumata). A sea star was found. It is the crown sea star (Asterina coronata). Throughout the trip, I saw 3 of my best friend - the striped hermit crab. 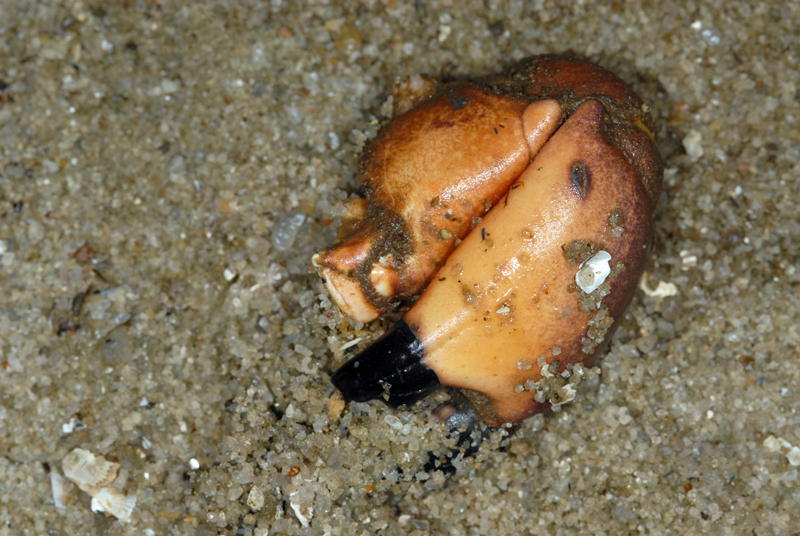 One of them was even clinging onto another empty shell, making sure that no other hermit crab takes it away. The shore of Punggol beach is very alive. There is so much to see on this shore. The good thing about this beach is that there are washing up facilities at the toilet nearby. We reached the shore in darkness, we left the shore in darkness. Tomorrow will be another crazy morning wake up session.